ANSAmed - News in the Mediterranean. Archives Portal Europe - Provides access to information on archival material from 17 European countries as well as information on archival institutions throughout the continent. Balkan Insight - Breaking news on the Balkan's economy, politics, business, entertainment, arts and culture. Baltic Course, The - Baltic States news and analysis. Business information about economic development in Latvia, Lithuania and Estonia. Belgium.be - Online information and services provided by public authorities in Belgium. Bosnia and Herzegovina - CIA World Factbook data. Bosnia Map Collection - Perry-Castañeda Library. BosniaLINK - The official Department of Defense information system about U.S. military activities in Operation JOINT FORGE, the NATO peacekeeping mission in Bosnia. Bosnian Institute - Organization providing education and information on the history and culture of Bosnia-Herzegovina.Through its programmes it actively encourages and supports the growth of a pluralist democratic society in Bosnia-Herzegovina and its neighbours. Supported by the Packard Humanities Institute and a number of other donors. Also see Bosnia Report, its bi-monthly magazine. Bosnia-Herzegovina Protest Files - News, statements and documents about protests in Bosnia-Herzegovina translated to English. Center for European Policy Analysis (CEPA) - A non-profit, non-partisan public policy research institute dedicated to the study of Central and Eastern Europe. Center for Transatlantic Relations - Research center that engages opinion leaders on contemporary challenges facing Europe and North America. The Center serves as the coordinator for the American Consortium on European Union Studies (ACES), which is a partnership among five national-capital area universities - American, George Mason, George Washington, Georgetown and Johns Hopkins - to improve understanding of the European Union and U.S-EU relations. Centre for European Policy Studies (CEPS) - Online publications, full-text and abstracts, and commentary index, largely on European Union. Centre for European Reform (CER) - A think-tank devoted to making the European Union work better and strengthening its role in the world. Chechnya - A federal subject of Russia (a republic). It is located in the southeastern part of Europe in the Northern Caucasus mountains. Kavkaz Center - A Chechen internet agency which is independent, international and Islamic. Provides reporting of events in the Islamic world, the Caucasus, and Russia. CSIS: Eastern Europe - Research and published analysis on U.S. policy toward Central, Southeast and Eastern Europe. The project is also engaged in the analysis of broader political trends encompassing twenty states and aspiring states in Eastern Europe, including the political and security impact of NATO and European Union enlargement. 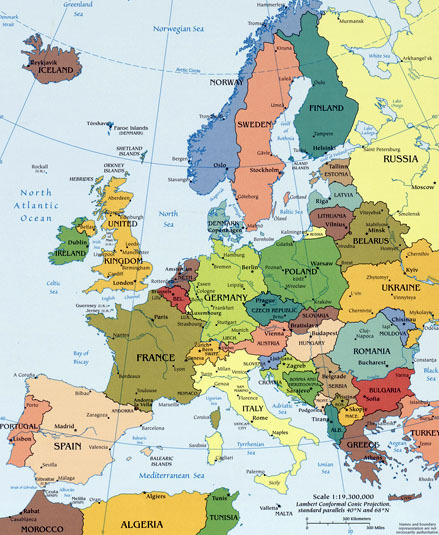 CSIS: Europe Program - Research and published analysis on U.S. policy toward Europe as well as perspectives of nation-states and the institutions to which these states belong or wish to join, including the European Union (EU) and the North Atlantic Treaty Organization (NATO). Cyprus Mail - Leading dialy in Cyprus. Czech Position - Czech politics, business and society. Greenland - An autonomous country within the Kingdom of Denmark, located between the Arctic and Atlantic Oceans, east of the Canadian Arctic Archipelago. DiEM25 - Pan-European, cross-border movement of democrats working to repair the many problems facint the European Union. Eastern Europe WWW Virtual Library - Search engines and Web Index Pages for country, language, or region-specific searches. El País - News from Spain in English. ENPI Info Center - This portal is one of the main communication tools of the ENPI Information and Communication Support Project, launched by the European Commission in January 2009 to make more known the relationship between the EU, its nine partner countries in the Mediterranean and seven neighbours and partners in the East. EuroDocs: Online Sources for European History - Links to European historical documents. Selected transcriptions, facsimiles and translations. EuroNews - Covers world news and broadcasts in 13 different languages 24 hours a day, 7 days a week in Arabic, English, French, German, Greek, Hungarian, Italian, Persian, Portuguese, Russian, Spanish, Turkish and Ukrainian. EuropaWorld Plus - The online version of the Europa World Year Book and the nine-volume Regional Surveys of the World series. First published in 1926, the Europa World Year Book is renowned as one of the world's leading reference works, covering political and economic information in more than 250 countries and territories, from Afghanistan to Zimbabwe. The Europa Regional Surveys of the World offer in-depth, expert analysis at regional, sub-regional and country level. European Central Bank - Chief financial institution of the European Union. European Commission - Policies, information and services. European Commission Libraries Catalogue (ECLAS) - A bibliographic database consisting of ca. 200,000 completed catalogue records in the domain of European affairs; about 7,000 new records are added annually. European External Action Service (EEAS) - Serves as a foreign ministry and diplomatic corps for the EU, implementing the EU's Common Foreign and Security Policy and other areas of the EU's external representation. The EEAS is under the authority of the High Representative for Foreign Affairs and Security Policy (HR), a post also created by the Treaty of Lisbon, whom it assists. European Leadership Network (ELN) - Works to advance the idea of a cooperative and cohesive Europe and to develop collaborative European capacity to address the foreign, defence and security policy challenges. Does this through its active network of former and emerging European political, military, and diplomatic leaders and through its research, publications and events. European Public Opinion Analysis - Website for the Public Opinion Analysis sector of the European Commission. European Union Institute for Security Studies (EUISS) - Research and debate on the major security and defence issues that are of relevance to the EU. European Union Libraries and Documentation Centres - Bibliographical references for publications on European affairs. European Union Gateway (EUROPA) - Provides links to the main governmental sites for each country, usually including the sites for Head of State, Government, Ministry of Foreign Affairs, and sometimes a portal site for the national civil service. European Union Press Room - News and press releases on the European Union. European, The - Views, debates, interviews. European Statistics (EUROSTAT) - The statistical office of the European Union situated in Luxembourg. Its task is to provide the European Union with statistics at European level that enable comparisons between countries and regions. Eurozine - A network of European cultural journals, linking up more than 80 partner journals and just as many associated magazines and institutions from nearly all European countries. Eurozine is also a netmagazine publishing articles from its partner journals with additional translations into one of the major European languages. Eurozone Portal - Official gateway to the Euro area (also known as the eurozone), consisting of 17 European Union countries that have adopted the euro as their currency. France.fr - Official website of France. Provides multilingual web site of reference about France intended for the international general public. French Politics - Blog from writer, translator, scholar Arthur Goldhammer. Also see Twitter account. Google France (Google.fr) - Search engine. La France Insoumise - Variously translated as "Unbowed France", "Unsubmissive France", or "Untamed France". A left-wing populist and democratic socialist political party in France, launched on 10 February 2016 by Jean-Luc Mélenchon, then Member of the European Parliament and former co-president of the Left Party (PG). It aims to implement the ecosocialist programme L'Avenir en commun (English: "A Shared Future"). La République En Marche! - Possible translation: "The Republic on the move! "; sometimes called by its old name En Marche ! (French: [ɑ̃ maʁʃ]; English translation: "Forward! ", "Onward! ", "Working!" or "On The Move! ", is a centrist and social-liberal political party in France. It was founded on 6 April 2016 by Emmanuel Macron, a former Minister of Economy, Industry and Digital Affairs, who was later elected President of France in the 2017 presidential election with 66.1% of the second-round vote. Frankfurter Allgemeine Zeitung (FAZ) - German dialy. German Foreign Policy - German news, interviews, history. Germany.info - German information source: politics, business, arts and culture, country profile, news and publications. Google Germany - Search engine. Spiegel Online - English language international edition of the German news source Der Spiegel also includes in-depth special reports, weblog and summaries of what the other German publications are reporting. Suddeutsche Zeitung International - Founded 1945, also known as SZ. Germany's largest broadsheet newspaper. Its online news web site Suddeutsche.de collects major articles of international relevance on this tumblr weblog. Global Balkans Network - An activist research, media, and organizing network that works in solidarity with Balkan social movements to investigate, publicize and impact political, social and economic struggles in the former Yugoslav and wider Balkan region. Coalition of the Radical Left - Commonly known by its Greek abbreviation ΣΥΡΙΖΑ (SYRIZA), is a coalition of left political parties in Greece. Its parliamentary leader is Alekos Alavanos, former president of Synaspismos, the largest of the parties that form the coalition. Georgios Papandreou - Greek of Greek-American origin, has been leader of the Panhellenic Socialist Movement (PASOK) party since February 2004. The son and grandson of Greek prime ministers, he was Minister for National Education and Religious Affairs two times (1988-1989 and 1994-1996) and Minister of Foreign Affairs from 1999 to 2004. In 2006 he became President of the Socialist International. See Wikipedia article. Greek Reporter - Portal for Greek people and people of Greek descent that live and work outside of their homeland and Greek news source for what matters to Greeks abroad. Hellenic Resources Network (HR-Net) - A leading source of information on and about Greece. News and information from over 30 news sources. Important documents, treaties and reports on Greece and Cyprus. Bulletin boards for announcing employment opportunities, cultural events, talks and presentations and upcoming conferences. Kathimerini English Edition - A conservative daily newspaper published in Athens and distributed exclusively with the International Herald Tribune in Greece and Cyprus. Keep Talking Greece - News, politics, economy and society. Reports from the Edge of Borderline Democracy - Greek news by journalists based in Athens, Greece, members of the team that publishes Unfollow. Yanis Varoufakis - Blog from Greek-Australian economist who served as Minister of Finance of Greece in 2015. The iconoclastic academic, who made international headlines with his brusque negotiating tactics and unusual fashion sense, led the negotiations up until the morning after the referendum of July 5. Both Varoufakis and prime minister Alexis Tsipras urged Greeks to vote against it-and about 60% of the country did so, handing them a victory. But the next morning, Varoufakis abruptly resigned as finance minister [ostensibly to help smooth his country's negotiations with creditors on a restructuring deal who objected to his participation at the talks], while retaining his parliamentary seat. Varoufakis maintains that the conditions imposed on Greece by creditors in the agreement reahed soon thereaft will "go down in history as the greatest disaster of macroeconomic management ever." GuiaNet (Portugal) - Business directory for Portugal. Caboodle.hu - Hungarian internet portal offering a mix of daily news stories, original features, event listings, user forums, free online marketplace, and other content. Magyar Hírlap - Hungarian news. Politics.hu - News or information about Hungary in English. Iceland Review - Daily updates of news from Iceland. Inside Europe - A guide to life inside the European Union provided by the BBC. News, reference guides, timelines, interactive maps, key institutions, EU budget, information on the Euro, and other EU coverage. An Phoblacht/Irish Republican News (Northern Ireland) - Daily Irish Republican news service. ARK - Established in 2000 as a joint project between Queen's University Belfast and the University of Ulster, ARK provides access a range of social and political material relevant to Northern Ireland. CAIN Web Service - Information and source material on 'the Troubles' and politics in Northern Ireland from 1968 to the present. There is also information on Northern Ireland society. Ireland.ie - Politics and current affairs discussion website. Irish Republican Army (IRA) - Overview provided by Global Security.org. Loyalist and Republican Paramilitary Groups - Information on the current position of the main Loyalist and Republican paramilitary groups towards the Good Friday Agreement and details of their ceasefire status. Newshound - Northern Ireland news. Northern Ireland Assembly - Established as part of the Good Friday Agreement. The Assembly is the prime source of authority for all devolved responsibilities and has full legislative and executive authority. Northern Ireland Conflict (1968 to the Present) - Information and source material on the troubles in Northern Ireland from 1968 to the present. Also, information on society and politics in the region. Northern Ireland Executive - Government of Northern Ireland. Northern Ireland Legislation - This site contains the full text of Acts of the Northern Ireland Assembly, the Explanatory Notes to the Acts of the Northern Ireland Assembly and Statutory Rules of Northern Ireland. Northern Ireland Office Online - The role of the Northern Ireland Office is to support the Secretary of State for Northern Ireland in securing a lasting peace, based on the Good Friday Agreement, in which the rights and identities of all traditions in Northern Ireland are fully respected and safeguarded and in which a safe, stable, just, open and tolerant society can thrive and prosper. Online Research Bank - A bibliography (over 900 references) of key research documents focused on social policy in Northern Ireland with, in many cases, a summary of the work. Political Parties in Ireland - A listing with links. Sinn Fein - Irish Republican party whose objective is to end British rule in Ireland. TheJournal.ie - Irish news website. Ulster Unionist Party - Committed to the Union and British citizenship and opposed to any form of nationalism. Italian Studies (NYU) - New York University library resources for information about Italian Studies, including language and literature. Italian Studies (UCLA) - UCLA holds one of the richest collections of Italian materials in the U.S.
Naples: Life, Death and Miracles - General culture of Naples, its history, art, archaeology, music, traffic, geology, literature. Maintained by Jeff Matthews. Society for Italian Historical Studies (SIHS) - A professional organization designed to encourage the study and teaching of Italian history and culture. Kosovo in Transition - News from The New York Times. Kosovo Specialist Chambers & Specialist Prosecutor's Office - Part of the judicial system of Kosovo. The Chambers are attached to each level of the Kosovo court system. They were established by a Constitutional Amendment and a Law adopted by the Kosovo Assembly to conduct trials for allegations stemming from the 2011 Council of Europe report, which alleges serious violations of international law. They are of temporary nature with a specific mandate and jurisdiction, namely over certain crimes against humanity, war crimes and other crimes under Kosovo law which allegedly occurred between 1 January 1998 and 31 December 2000. The Law allows for the relocation of the proceedings outside Kosovo. The Specialist Chambers have a seat in The Hague, the Netherlands, and are to be staffed with international judges, prosecutors and staff. Krakow - Comprehensive information on the city of Krakow (Cracow) in Poland. Nereus - An international network of leading European economics information providers and brokers. One of the key objectives of Nereus is to create integrated access to the content-rich economics resources of key libraries, academic publications and e-resources in Europe via one www portal, making it the starting point for the academic community for economic information and knowledge. NewEurope - European political newspaper. North Atlantic Treaty Organization (NATO) - Official site. Access to information on NATO's policies and structures, official documents, press releases, speeches and publications and provides links to other relevant sites. Government.no - Information from Norweigian Government and the Ministries about Norway in English. NEWSinENGLISH.no - Views and news from Norway. Poland.pl - Official information portal of the Republic of Poland, run by the Ministry of Foreign Affairs. Politica Critique - A European online magazine for democracy, equality and culture beyond the nation-state. Based in Warsaw, Poland. Publications Office of the European Union - The official publisher of the institutions and other bodies of the European Union: European Parliament, Council of Ministers, European Commission, Court of Justice, Court of Auditors, Economic and Social Committee (ECSC), Committee of the Regions, European Centre for the Development of Vocational Training (CEDEFOP), European Foundation for the Improvement of Living and Working Conditions, European Investment Bank (EIB) and other agencies. REESWeb - Russian and East European Studies Virtual Library. Revolting Europe - Tom Gill's blog on Europe, the Left, labor and social movements. Sabah - Daily news from Turkey. Scotland Legislation - This site contains the full text of all Acts of the Scottish Parliament, the Explanatory Notes to the Acts of the Scottish Parliament and Scottish Statutory Instruments. Solidarity - Scotland's socialist movement. b92 - Founded in 1989 as a youth radio broadcasting to Belgrade audiences and has since grown into a company which includes a national radio and television network and a website. Institute of International Politics and Economics (IIPE) - One of the oldest institutes in South Eastern Europe specialised in the field of international relations. Located in Belgrade, Serbia. Serbian Government - Official government site. Social Europe Journal (SEJ) - Forum for debate on issues of interest to progressives across Europe and beyond. Barcelona City Council [Ajuntament de Barcelona] - Learn how Barcelona City Council is managed: organisation, government strategy and action, administrative information, procedures and communication channels. EFE Agency - The leading Spanish language news agency and the fourth largest news agency in the world. El País - Highest-circulation daily newspaper in Spain. Podemos - A left-wing political party in Spain founded in 2014 by writer and professor Pablo Iglesias. Also see Wikipedia. Statewatch - Monitoring the state and civil liberties in the European Union. Supreme Headquarters Allied Powers Europe (SHAPE) - Headquarters of Allied Command Operations (ACO), one of NATO's two strategic military commands. It is located at Casteau, north of the Belgian city of Mons. Sweden.se - Official gateway to Sweden. Swedish Prosecution Authority - Prosecution areas consist of the country's 32 public prosecution offices, with a geographical sphere of operation that is approximately equivalent to a county. In the Stockholm and Malmö there are several local public prosecution offices. The authority also has international public prosecution offices with specialist competence in order to combat organised cross-border crime and to permit international co-operation between prosecutors. The international prosecution offices in Malmö and Göteborg are part of South and West Public Prosecution Area, respectively. The Local Sweden - Sweden's news in English. Liechtenstein - The Principality of Liechtenstein is a tiny, doubly landlocked alpine country in Western Europe, bordered by Switzerland to its west and by Austria to its east. Mountainous, it is a winter sports destination, although it is perhaps best known as a tax haven. Also see Wikipedia article. Yoodle - The search index of Switzerland. Yoodle lists thousands of Swiss and Swiss-related Web sites in an online index organized by category and/or canton. Transitions Online - A leading Internet magazine covering Central and Eastern Europe, the Balkans, and the former Soviet Union. Another Europe Is Possible - Formed in February 2016 to campaign for a Remain position in the EU referendum from a specifically left, progressive perspective, working across party political lines to campaign for democracy, human rights, and social justice. Brexit Jargon - Provided by BBC News. Brexit Negotiations - The Article 50 negotiation process and principles for the United Kingdom's departure from the European Union. On 29 March 2017, the United Kingdom notified the European Council of its intention to leave the European Union, in accordance with Article 50 of the Treaty on European Union. On 29 April 2017, the European Council – made up of the heads of state or government of the 28 EU countries – adopted a set of political guidelines, which define the framework for the negotiations and set out the EU's overall positions and principles. The EU is represented by Michel Barnier, as Chief Negotiator for the 27 EU countries. His taskforce at the European Commission coordinates the work on all strategic, operational, legal and financial issues related to the negotiations. British Monarchy - Official site. CAP Payments Search - The Common Agricultural Policy (CAP) is the agricultural policy of the European Union. It implements a system of agricultural subsidies and other programs.This page allows you to view amounts received by beneficiaries. CBI - The UK's top business lobbying organisation, represetning more than 240,000 companies of every size, including many in the FTSE 100 and FTSE 350, mid-caps, SMEs, micro businesses, private and family owned businesses, start ups, and trade associations. Economic Implications of Brexit - Researchers from the U.S. and RAND Europe explored the economic implications of eight different trade scenarios involving the UK, EU and U.S. after Brexit. The study also aimed to create a better understanding of how a variety of factors might affect the outcome of Brexit negotiations between the UK and EU. Finally, the study explored the potential implications of Brexit for the U.S., including the effects on its economic, political and security interests.The study used an economic model to analyse the potential economic implications of eight different trade scenarios. These scenarios included five "hard Brexit" options. Also see Calculating the Economic Consequences of Brexit. This calculator - based on RAND's After Brexit report - allows users to examine how the negotiations are likely to affect these three economies in the 10 years after Brexit negotiations conclude. It shows the economic effects of the UK's withdrawal from the EU under five proposed "hard Brexit" scenarios - ranging from complete economic separation with a return to World Trade Organization rules to an Atlantic trade partnership that includes the UK, U.S., and remaining European states (EU27). EU in the United Kingdom - A weekly summary of developments in the European Union, by the European Commission representation in the United Kingdom. Financial Conduct Authority (FCA) - The conduct regulator for 56,000 financial services firms and financial markets in the UK and the prudential regulator for over 18,000 of those firms. Google UK - Search engine. House of Commons Daily Debates - Printed transcripts of parliamentary debates for the House of Commons of the United Kingdom. Also see Hansard. Independent Police Complaints Commission (IPCC) - A non-departmental public body in England and Wales responsible for overseeing the system for handling complaints made against police forces in England and Wales. Institute for Government - Working to increase government effectiveness in the UK. Judicial Committee of The Privy Council (JCPC) - The court of final appeal for the UK overseas territories and Crown dependencies, and for those Commonwealth countries that have retained the appeal to Her Majesty in Council or, in the case of Republics, to the Judicial Committee. Labour Lords - Labour's team in the Lords, holding the government to account and addressing issues affecting the lives of people both in the UK and around the world. Local Government Chronicle (LGC) - News, comment and analysis on local government, including politics and policy, services, the regions, investment and job opportunities. London Reconnections - Covering transport topics in and around London. Mark Curtis - Blogging and writing on British foreign policy and international development. National Archives (UK) - Access original historical documents, some of them over 1000 years old, and the catalogues that describe them. The national archive of England, Wales and the United Kingdom. It brings together and preserves the records of central government and the courts of law, and makes them available to all who wish to consult them. The records span an unbroken period from the 11th century to the present day. Also see DocumentsOnline. New European, The - All the latest news, commentary and analysis on Brexit. OurKingdom - Investigates the crisis of democracy in Britain and analyses how its failings can be redressed. Maintained by openDemocracy. Politics Home - UK politics. Resources for Tracking U.K. Legislation - Electronic resources for tracking UK legislation. Presented by Stephen Young is a reference librarian at The Catholic University of America, Kathryn J. DuFour Law Library. Special Branch Files Project - A live-archive of declassified files focussing on the surveillance of political activists and campaigner. This project is indebted to the journalists and researchers who have generously made their files available and accessible as a matter of public record. The site provides access to the documents themselves, complemented with engaging analysis in background stories. The documents reveal the details recorded by Britain's secret police about a range of protest movements in the UK since 1968. Stationery Office (tSO) - Publishes official and regulatory information for the UK's Government and Parliament. Trust for London - Tackling poverty and inequality. UK.gov - UK government services, departments, information, and publications. Also see Prime Minister's Office, 10 Downing Street. UK Border Agency - Protects the UK border. One of the largest law enforcement agencies in the UK. Also see Independent Chief Inspector of UK Border Agency. UK Co-ordinating Body (UKCB) - Co-ordinates the implementation of EU regulations across the UK. UK Government Digital Service - Forming networks of people with different skills and from different departments, who will work together to improve end-to-end services that cross departmental boundaries. UK Home Office - Lead government department for immigration and passports, drugs policy, crime, counter-terrorism and police. UK Independence Party (UKIP) - A Eurosceptic right-wing populist political party in the United Kingdom, founded in 1993. Also see Wikipedia. UK Parliament: The House of Commons - Information about the work of the House of Commons and its Committees, its membership, and its history and powers. UK Legislation - This website is managed by The National Archives on behalf of HM Government. Publishing all UK legislation is a core part of the remit of Her Majesty's Stationery Office (HMSO), part of The National Archives, and the Office of the Queen's Printer for Scotland. The site contains the full text of all Public and Local Acts of the UK Parliament, the Explanatory Notes to Public Acts, Statutory Instruments and Draft Statutory Instruments; and Measures of the General Synod of the Church of England. The site includes the full text of all legislation enacted by the UK Parliament and delegated legislation (Statutory Instruments) whether this applied to the United Kingdom as a whole or only to constituent parts of the UK. UK Parliament - Official home page. The UK Parliament is based on a two chamber system. The House of Lords and the House of Commons sit separately, and are constituted on different principles. WhatDoTheyKnow - Make a request for information to a UK public authority: by law, they have to respond. Get answers from the government and public sector. Voice of Roma (VoR) - It is VoR's mission to promote and present Romani cultural arts and traditions in a way that counters both romanticized and negative Gypsy stereotypes, and in so doing, to contribute to the preservation of Romani identity and culture. VoR also works to heighten awareness of human rights issues faced by Roma in today's world, and to support efforts by Roma to (re)build and maintain their communities, improve their lives, and to strengthen the Romani voice both nationally and internationally. Prince of Wales - The official website of Their Royal Highnesses The Prince of Wales, The Duchess of Cornwall, Prince William and Prince Harry. Wales Legislation - This site contains the full text of all Statutory Instruments made by the National Assembly for Wales. Western Europe WWW Virtual Library - Search engines and web index pages for country, language, or region-specific searches. Western European Studies Section (WESS) - Professionally involved in the acquisition, organization, and use of information sources originating in or related to Western European countries. WWW Virtual Library: Russian and East European Studies - A comprehensive index of resources on the Balkans, the Baltic states, the Caucasus, Central Asia, Central Europe, the CIS, Eastern Europe, the NIS, the Russian Federation, and the former Soviet Union, from the University of Pittsburgh. This webpage last updated on Monday, February 18, 2019 2:10 PM.